Rather than wait for the police to evict us from our second occupied block, 69-76 Chartridge, we took the initiative, and moved into another empty nearby earlier this week. We are now in occupation of the disused council offices at the base of Chiltern House, at the corner of Portland Street and Albany Road. We have spent the past few days cleaning the place up, and trying to fix some of the disrepair and damage it’s suffered since the Property and Regeneration Departments moved to their new offices, over five years ago. We’ve already held a few events in/ at our new space, and hope to organise more over the next couple of weeks. Keep checking the website for news, and details of film screenings, meetings, music and more. On Thursday night we’ll be opening our new cinema room, to show footage from the estate alongside films from around the world. And serving dinner. This week, there’s a ‘March for the Aylesbury’ on Saturday 14th March. Called by Defend Council Housing, it starts in Burgess Park at 12 noon. We invite you to come and visit the occupation at Chiltern House after the march. 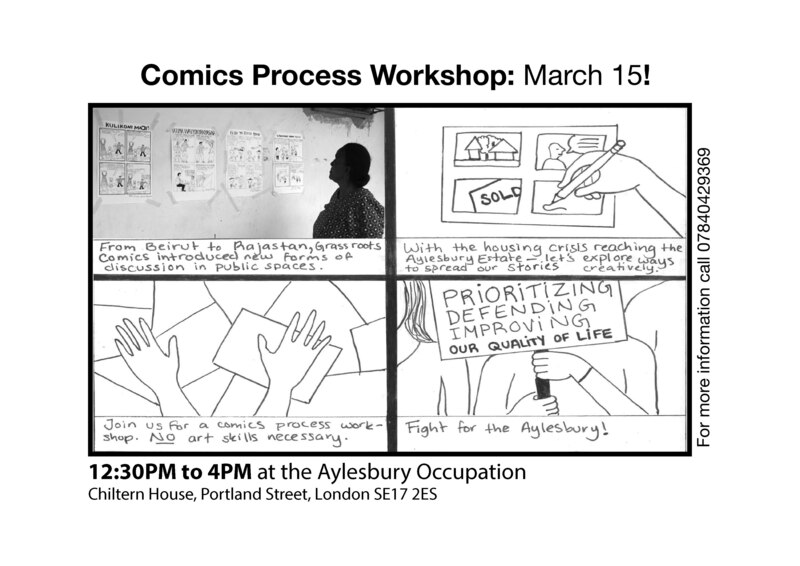 12.30 -4pm – An opportunity to create grassroots comics about the ‘regeneration’, and what’s happening to the estate, led by experienced cartoonists. All welcome, whatever your level of artistic skill! From 5pm onwards, a Practical Squatting skillshare: learn how to squat yourself! From 6-7pm, a dance class – come and learn to dance tango!